When the Dallas Stars’ Rich Peverley collapsed on the bench during Monday night’s Stars-Columbus Blue Jackets game, there was initial confusion. Both teams are headed through the tunnel. No update yet on exactly what happened. Then came word what had happened. UPDATE: Rich Peverley has been taken to the hospital an is conscious. The game is still delayed at the moment. That's all we know for now. Jody Shelley on the TV broadcast says Dallas Stars player Rich Peverley "keeled over" on the Stars bench. Describes scene as "somber panic." A bit less than a half-hour later, the Stars let everyone know that Peverley — who had been treated for an irregular heartbeat at the beginning of the season – had suffered a "cardiac event" but was OK.
And that stuff about hockey players being tough? It’s not just a cliche. And everybody was on board with the NHL’s decision to postpone the game. Don't know how you could play after that. Good on NHL. Good on medical staff. 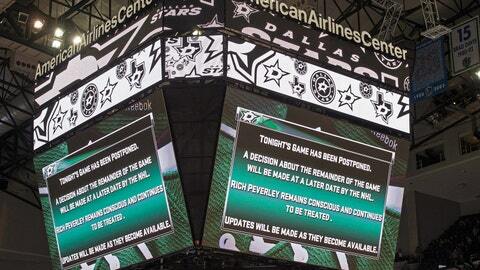 Prayers for Peverley. Nobody needs to see the Stars/Blue Jackets game finished tonight. We all need to see Rich Peverley back in good health.